Bella Vista Optimist Club held its annual Youth Memorial Program on Aug 9. This program was created to honor deceased members of the club. Seated (from left): Sgt. 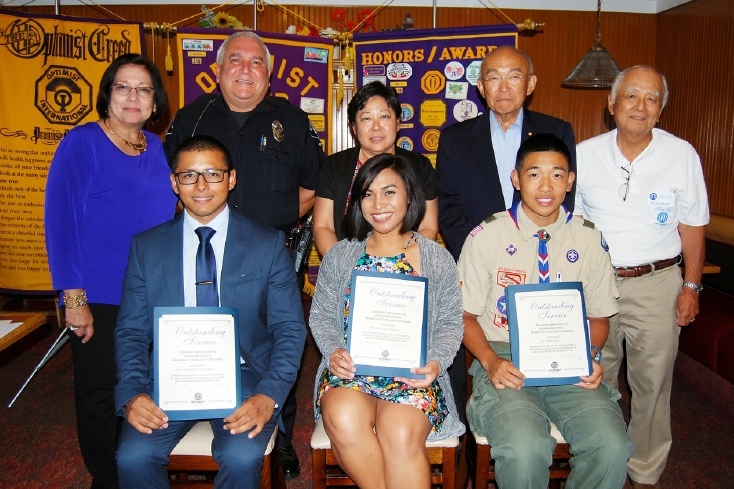 Anthony Sanchez, Montebello Fire Explorer; Bielena Joy Reyes, Montebello Plymouth Church; Anthony Yan, Eagle Scout. Standing (from left): Elizabeth Baca, program chair; Cpl. Ernie Barron; Lori Katayama; George Takahashi; and President Mitch Sakado.